i love the business sense of the band, but why would he ever say anything else but this quote? they sell their records, don't they? KISS bassist/vocalist Gene Simmons spoke to Billboard.com about the band's recently completed 20th studio album, "Monster", which is scheduled for release in July. The follow-up to 2009's "Sonic Boom" was again produced by KISS fronman Paul Stanley and was described by Simmons as "either the best or one of the top three records we've ever done. Port Orchard, WA – Three years, two full length albums, an EP, countless appearances on compilations and 7” projects, deluxe re-issues of out of print albums . . . the only thing missing from the Stone Axe repertoire is a full length live album. Wait no longer! Stone Axe and Ripple Music will be releasing the first full length live album from the Washington based rock n’ roll preservationists on May 8th in North America (May 7th in the UK). Stone Axe: Captured Live! is a fifteen track time capsule from the 2011 edition of the Roadburn Festival held on an annual basis in Holland. This recording, indeed, captured the band in all of their rock n’ roll fury, steamrolling through a raucous set of music that has the crowd cheering, singing, and clapping along. In addition to this release, Stone Axe were recently handpicked by the editors of Metal Hammer to have their song "Old Soul", from Stone Axe II - Deluxe Edition (available now from Ripple Music), included on a special issue covermount CD. This special issue pays homage to Black Sabbath is entitled 'The Sons of Sabbath' and will be available at the end of May! 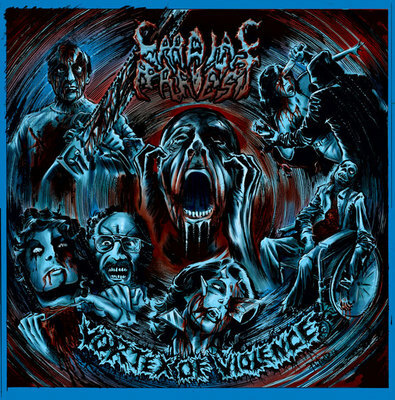 Following up the bulldozer that was 2010's "Haven For The Insane", Chicago-based death metal purists CARDIAC ARREST are set to return this spring with their highly-anticipated fourth full-length album. On the aptly titled "Vortex Of Violence", CARDIAC ARREST once again demonstrates what true death metal is all about with a vicious and relentless assault of grinding intensity and neck-snapping aggression.